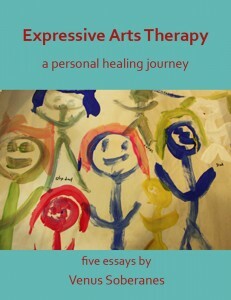 Written by Venus Soberanes and documenting her own journey to becoming a therapist, ‘Expressive Arts Therapy – a personal healing journey’ exposes a powerful form of healing that also capitalizes on the imagination and individual uniqueness. Comprised of five powerful essays, Soberanes’ book is resonating with readers who want to overcome their own personal challenges to live a life of limitless creative possibility. Vancouver, BC – While those suffering from trauma, abuse and mental health issues may initially turn to pharmaceuticals for solace, a compelling new book of essays proves the power and transformational potential of Expressive Arts Therapy. ‘Express Arts Therapy: A Personal Healing Journey’, by Venus Soberanes, shares the author’s bold journey to becoming a therapist and achieving radical personal change as a result of her training. By sharing all she has learned and experienced, Soberanes hopes others will consider expressing their own individual creativity through art. The immaterial fish; a therapeutic journey of imaginal transformation talks about dreams; how I was able to work with a recurring dream in waking life and transform it completely in the dreamtime; it talks about the independent life of images and it is a great example of how the imagination works as a tool for healing and transcendence. Moving in my dreams; the relationship between movement and consciousness talks about the powerful relationship between movement and consciousness; it relates a variety of experiences in which I was able to change my perspective and my feelings around an issue through moving intentionally. It also talks my passionate connection to dreams and the transference of knowledge and experience from the dream realm to the waking life. Imaginary encounters with five psychological geniuses and how I changed my – troubling – spending habit talks about an exercise of imagination, in which I psychoanalyzed myself through five therapeutic schools of thought to try and find a solution to a not-so-dignifying spending habit. And it worked! My experience of trauma and recovery through Expressive Arts Therapy talks about my experience of Post Traumatic Stress Disorder and Panic Disorder and how I helped my recovery process through art making, even before I knew Expressive Arts Therapy. The gifts of Expressive Arts Therapy talks about my experience doing a therapy practicum with survivors of torture, with children in an inner city school and with adults who have a mental health diagnosis. This essay relates individual sessions with particular clients, exemplifying the way I conducted my EXAT therapeutic practice. It also includes powerful insights and thoughts I had during this challenging time. “Very few books have been written on the subject of Expressive Arts Therapy. Among those that do exist, mine is unique as it is the only book written from a therapist’s perspective; chronicling how I healed myself through art and movement. It’s a very powerful combination,” says Soberanes. Venus Soberanes is a visual artist, Expressive Arts Therapist, published author, jeweler, experimental filmmaker, life coach and shamanic dreamer. Her film and video pieces, highly inspired by her dreams and her family history, have screened in a number of international film festivals; her photography and visual art works have shown in individual and collective exhibitions around the world, and her jewelry is sold in numerous museum gift shops, including the Frida Kahlo Museum, the Anthropology Museum, the Modern Art Museum and the Contemporary Art Museum – all in Mexico City. She currently lives and works in Vancouver, Canada, and she is passionate about her work with people, both as an Expressive Arts Therapist and a Transpersonal Life Coach. This entry was posted in blog and tagged Art therapy, book, creative writing, ebook, Expressive Arts, Expressive Arts Therapy, individual therapy, media, press release, Therapy vancouver, Venus Soberanes by admin. Bookmark the permalink.